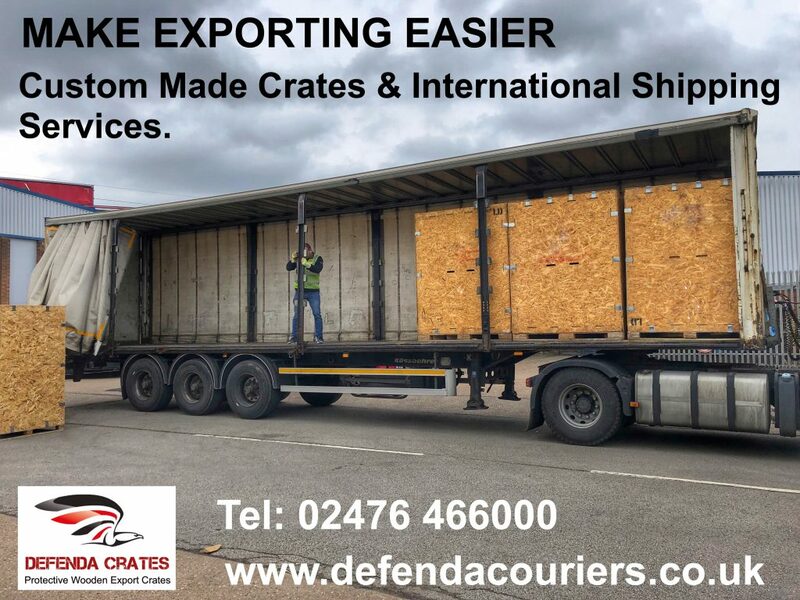 Defenda Crates are Wooden Shipping Crates we produce to a customer’s requirements to ensure the ultimate protection of their goods during transit. All of our wooden / timber export crates, containers, pallets or cases comply with ISPM15 are stamped and can be produced very quickly when a pressing shipping deadline needs to be achieved. We can help you with many of the issues that surround exporting your products including providing made to measure packing cases and extremely competitive international shipping rates for the goods or items you are exporting. We also provide import services for numerous companies around the U.K.
We also specialise in domestic U.K. shipping of large loads, pallets, parcels & even urgent documents. Based in Coventry we supply our custom made storage & export packaging crates nationwide. Simply call us to discuss the exact size and specification you require. Storage crates, cases & containers can also be made at extremely competitive prices. Our Defenda export pallets & crates are ISPM15 certified where necessary. Often specified as wheat stamped / marked or corn stamped / marked crates or containers by importers to the USA, Canada etc. This is simply because the IPPC Certified Stamp on the timber contains a wheatsheaf. They are also often called bug stamped timber crates. The IPPC stands for the International Plant Protection Convention which works to prevent harmful bugs, fungi etc being introduced to new environments through the transit of goods in wooden crates, containers, cases, boxes or dunnage. ISPM15 wood / timber is heat treated or fumigated using methyl bromide. Custom wooden shipping crates / packing cases for storage or export. Timber / wood ISPM 15 certified. 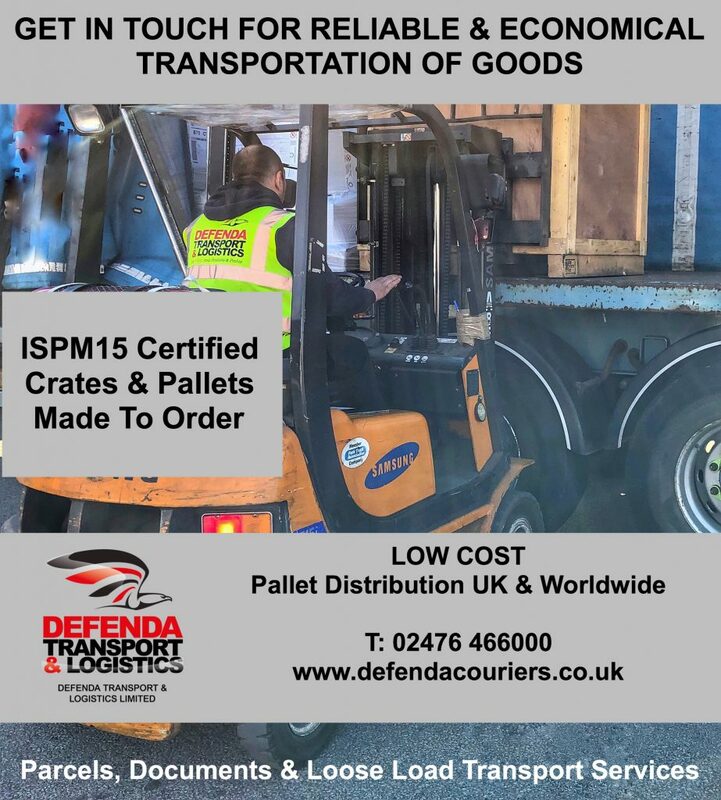 New IPPC ISPM15 certified pallets are also made & supplied to a customer’s specification — or as Standard or Euro pallet sizes. Used wooden pallets are also available. This entry was posted in News and tagged cases, ispm15, New Pallets ISPM 15 CERTIFIED, Shipping crates, Used wooden pallets, Wood storage crates, wooden containers, Wooden Shipping Boxes on April 9, 2019 by Paul Clark.